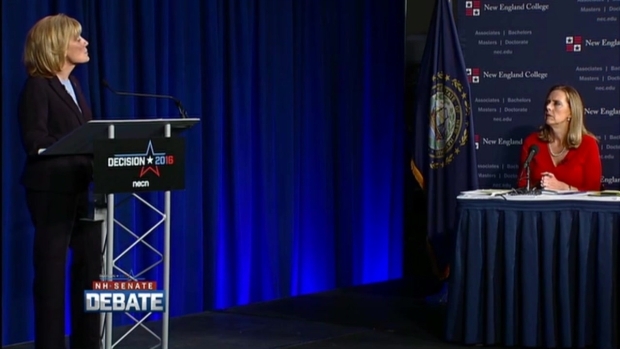 New Hampshire's U.S. Senate candidates faced off Monday in the first televised debate of the hotly-contested campaign. And two of the most memorable exchanges involved their parties' respective presidential nominees. Republican incumbent Kelly Ayotte and Democratic challenger Gov. Maggie Hassan touched on a wide range of topics, including Super PACs, ISIS, the state's opioid crisis and GOP presidential nominee Donald Trump's tax returns. Republican U.S. Sen. Kelly Ayotte and challenger Democratic Gov. 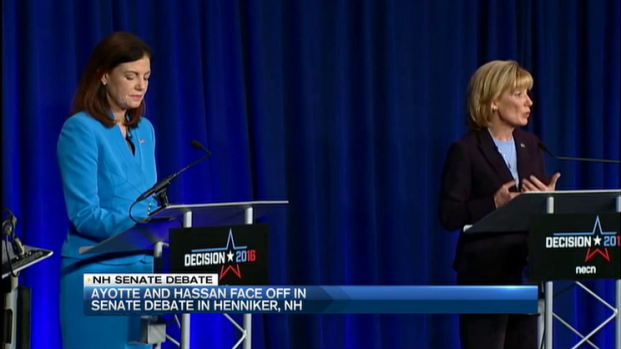 Maggie Hassan faced off Monday night in the New Hampshire Senate debate. One of the most noteworthy moments came when Ayotte was asked if she would tell a child to look up to Trump as a role model. "I think that certainly there are many role models that we have and I believe he can serve as president and so, absolutely, I would do that," she said. But less than three hours after the debate had ended, Ayotte issued a statement saying that she "misspoke" when asked about Trump. "While I would hope all of our children would aspire to be president, neither Donald Trump nor Hillary Clinton have set a good example and I wouldn't hold up either of them as role models for my kids." Ayotte did say later in the debate that Trump should release his tax returns. She also pointed out that while she is voting for Trump, she has stood up to him "on multiple occasions" in the past and argued that Hassan "is lock-step with Secretary Clinton." But the damage may have already been done. The Hassan campaign issued a release of its own Monday night, including some of the numerous tweets reacting negatively to Ayotte's "absolutely" comment. The campaign has already scheduled a Tuesday morning media call in an effort to focus even more attention on the remarks. Hassan was also asked to defend her party's nominee on Monday, and said she finds Hillary Clinton to be "honest and trustworthy," after three times failing to answer that question in a previous interview. "I certainly didn't give my best answer," she acknowledged. She added that national security and foreign policy experts in the GOP also find Clinton more qualified than Trump. "What I find very concerning is that at a time when our country faces so many evolving national security threats that my opponent is supporting Donald Trump, who members of her own party say poses an absolute danger to our country's vital interests," Hassan said. 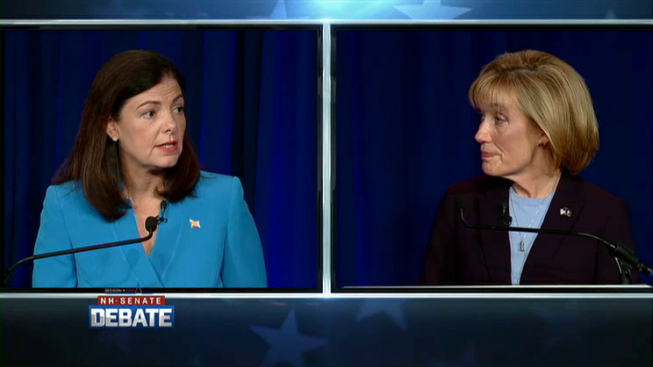 The Ayotte-Hassan race is seen as one of the tightest Senate races in the country. Tens of millions of dollars have flooded the airwaves as the two sides fight for ground in the key swing state. 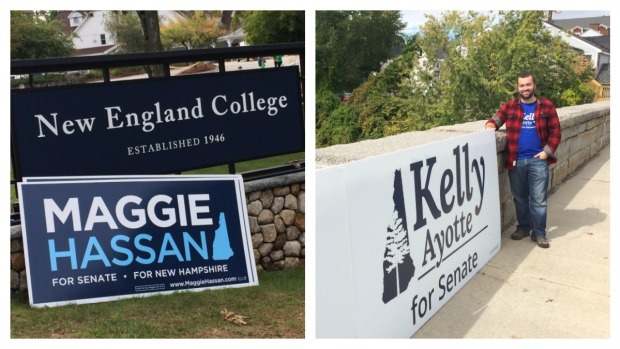 Monday's Senate debate at New England College was the first of two debates being aired by necn this week. The governor's debate between Republican Chris Sununu and Democrat Colin Van Ostern will be held on Wednesday, Oct. 5, at 7 p.m. The debates are co-sponsored by the Concord Monitor, WGIR-AM 610, WKXL-AM 1450 and New England College.